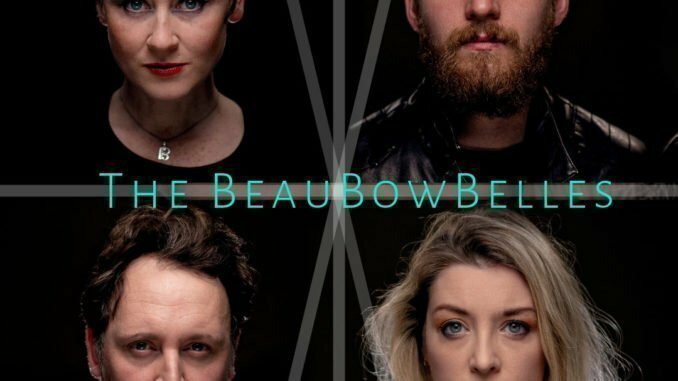 Weightless is the brand new single from The BeauBowBelles. Released on 1st May, it sets a new pace and intensity for the band. “Weightless” addresses the internal struggles of an anxious mind, forever in fear of the ugly voice that only serves to undermine and disconnect you from the world. Leaving behind the swing elements of some of their previous recordings this song is rooted in the alternative contemporary folk genre with a hint of Nordic folk but still retaining the close-part harmonies, driving rhythms and soulful melodies that they have been known for. The lyrical content is far darker and more soul-baring than any of their previous songs and Weightless professes a maturity in their songwriting, production and performance. Weightless was produced by David Holmes at Soup Studios, Lightship 95. So, The BBBs first came together in early 2010 as a female vintage 3 part harmony group focusing mainly on cutesy covers as well as a few original songs. Over the past 9 years the band has grown up and evolved into something almost unrecognisable from those early whimsical days. They describe themselves as Swing Folk as their music inhabits both the storytelling depth and heart of contemporary English folk with the more bawdy thumping accents of gypsy swing. All sung in beautiful three-part harmony and underpinned by their classical music background. Since they first started they’ve released two records in 2013 (To the Moon) and 2015 (A Thing of Reality) both recorded with David Holmes, but despite regular performances, there has been no new releases until now. The last few years has seen some disruption with a line up change (original member Ros Wilks being replaced by Mitch McGugan) as well as a few births along the way. But 2019 brings the release of their first record in 4 years, which will be released series of singles starting with Weightless (01/05/2019).